We never intended to make Hazard Monitoring Equipment!!! 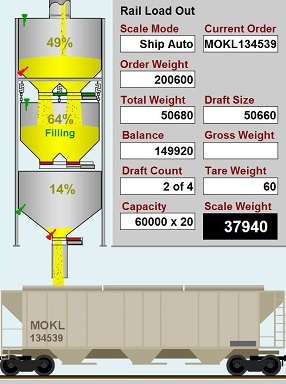 We provide automation systems for the grain industry. When we installed the industry leading hazard monitoring equipment our customers had a huge problem with spurious alarms forcing our automation system to shut down equipment. Our customers need monitoring equipment that is accurate, reliable, fast and easy to install. There was nothing available so we have jointly developed the SmartWatch system. They system works as a standalone unit or fully integrates with any control system. Digital Sensor Technology – Using digital technology results in a more stable and accurate reporting of the actual temperature and speed. The analog value is converted to a digital encoded signal right at the sensor with internal diagnostics constantly checking the sensor for proper operation. Each sensor has a unique serial number so it can be plugged into any connecting block and it is properly identified by the system. 128 temperature points and 10 rotation sensors can be scanned and updated in less than 5 seconds. Easy Modular Installation – Speed sensors are connected using intrinsically safe RS485 communications cable while the sensor network uses Cat5 Ethernet cable. Because of its network topology, the need to run thousands of feet of thermocouple cable back to a single point is eliminated. SmartConnect sensor connection blocks further simplify the cabling and network installation. Each sensor comes terminated with a modular connector and a pre-installed cable strain relief that simply plugs into the SmartConnect blocks. Since the wiring between the SmartConnect blocks and the temperature sensors is intrinsically safe, installation time and the related costs are dramatically reduced through the use of armored Cat5 cable that can be strung along side of a conveyor or existing conduit. CompuWeigh provides all the materials required including the SmartConnect mounting boxes, termination tool and cabling. All Cat5 cable utilizes 110 style IDC connections that allow for easy and reliable terminations. Easy to use Operator Interface – The SmartWatch host controller allows easy setup and monitoring of all the sensors used throughout the system. Separate screens are dedicated to setup and monitor alignment, bearing temperatures and speed sensors. System configuration and device configuration are stored in the host controller and can be downloaded to components that have been replaced. Differential Temperature Monitoring – Due to the broad range of ambient operating temperatures, acting solely on fixed temperatures for Warning and Alarm Setpoints is inherently unreliable. SmartWatch combines temperature setpoints with differential temperature monitoring routines where one side of the equipment is compared to the other side. This allows the system to pick up subtle temperature changes more quickly. Reliability and Integration – Since information provided by the hazard monitoring system is key to making important decisions on whether equipment should be allowed to operate, it is essential that it is reliable and can easily communicate to the central Control System. SmartWatch has addressed these issues because the host controller provides direct integration to the PLC and HMI systems using the industry standard ModBus communications. While many systems rely on a single alarm contact for the entire hazard system, SmartWatch continuously transmits the actual bearing temperatures and equipment speeds to provide a more robust and comprehensive set of information to the control system. A standalone system is available for those applications not requiring integration to a control system. Connects up to 32 1-Wire sensors to the ModBus RTU 485 field bus. Housed in a cast aluminum fully sealed enclosure. The sensor bus is certified intrinsically safe for Class 1 & 2, Groups A-G, Divisions 1 & 2. Designed to sense the speed of rotating shafts on conveyors and bucket elevators. Communicates using ModBus RTU protocol on a RS485 network. Includes 120VAC outputs to directly interrupt the motor control circuit should the system not achieve the correct speed after a startup delay. Automatic speed calibration. The mGP145 is rated for use in Class II, Group G, Division 1 and 2 hazardous areas. Connects up to 4 sensors to the sensor bus. Includes punch down terminals for up to 3 CAT5 bus cables. Has segment disconnect switches and indicators to aid in diagnostics. Includes NEMA4X indoor/outdoor enclosure, mounting pan and wire clamps.